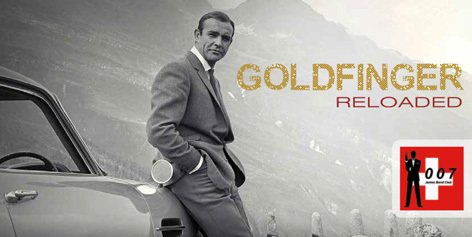 On September 13th 2014, the James Bond Club Switzerland hosts an exclusive event "Goldfinger Reloaded" to celebrate the 50th anniversary of the movie Goldfinger on the original movie locations in Andermatt, Realp and Furkapass in Switzerland. Special guests include Bond Girl Tania Mallet (Tilly Masterson in Goldfinger) and Norman Wanstall (Oscar®-winner Best Sound Effects Goldfinger). At noon on September 13th, all participants will meet in Andermatt (exact location to follow), after which everyone will ride in a convoy with a bus, a Ford Mustang Convertible, Aston Martin DB5 and Rolls-Royce Phantom 3 over the Furkapass with various stops at the original movie locations of Goldfinger, including a professional photo shoot. After the tour there will be a dinner (meat and vegetarian options available) followed by autograph-hours (possibility to acquire additional memorabilia, photos, etc. ), meet & greet, talk with other surprise guests and more. Signing up for the event is exclusive for Swiss Bond Club members until June 1st 2014, and after that available for everyone, depending on availability. For more information, visit the James Bond Club Switzerland website or check the Facebook page of the club.